Right now, here in Paris, we have seven different nests. That’s not counting our old water mill, two hundred miles from Paris. I spend half my time rousting out, fixing up, furnishing these nesting places. Rats’ nesting’s what it all is; can’t seem to keep myself from burrowing, digging in; always stuffing bits and pieces into one corner or another. The Winter Wonderland! 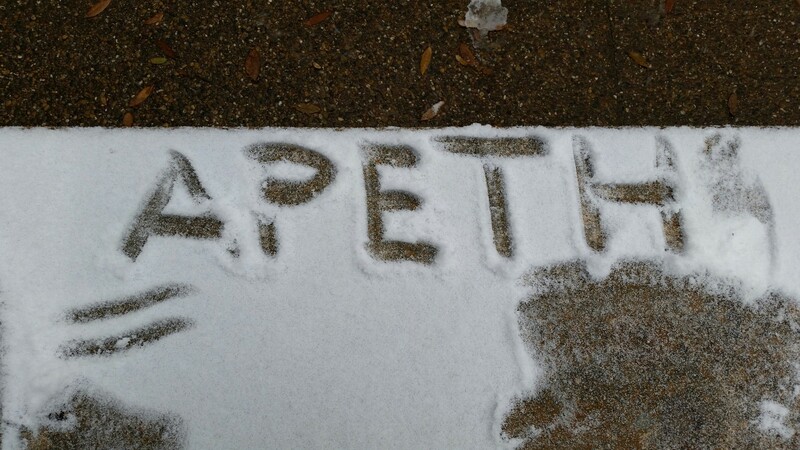 A second consecutive day,snowbound in Arlington, Texas (strangest of places for this to happen). Untold blessings have unfolded in this experience, probably the greatest was fulfilling this desire for nesting. Possessing zero skills for interior decorating, I nevertheless love the ongoing process of creating nests throughout my home. Today saw the emergence of several more reading nooks, small libraries, cozy corners with reading chairs and lamps, along with some alterations to my art studio and music rooms. 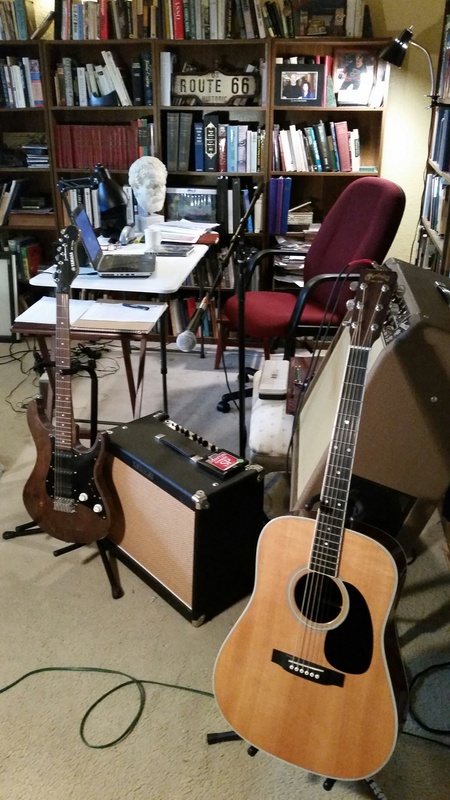 Finding just the right niche for guitars, amps, drafting tables and writing desks has added to the pleasure. Though I still have this grading albatross about my neck, I find now a more suitable place to carry out my onerous task. The stereo that has lived in the garage studio for a few years now has been moved to my living room, and what a delight I found in getting reacquainted with my old Pioneer turntable! About ten years ago, I received this second-hand turntable as a gift from my brother, and once word got out that I was saying Yes to vinyl, many friends starting unloading their collections on me, and I in turn began visiting vintage vinyl stores in Fort Worth, Arlington and St. Louis. This resulted in a shelf with a couple of hundred albums, many of which I have not yet heard. Today I put on Stephen Stills, Manassas (I have no idea who gave it to me, but I never took it out of its cover till now) and WOW! What an incredible sound! The turntable has spun all afternoon as I’ve revisited Crosby, Stills, Nash & Young, and a stack of Jazz albums awaits. At least I can grade to music well into the cold night. My new reading nooks have been outfitted with Annie Dillard’s Living by Fiction and Vladimir Nabokov’s Pale Fire. These wonderful creative spirits have provided wonderful, cozy company when I’ve taken breaks from the grading nemesis. The music studio has also provided a healthy diversion from a humdrum kind of task-driven day. The acoustic and electric guitars compete for my attention now, but that’s a good thing. So much music waits to be explored. I actually started writing a new composition of my own a few days ago and am glad to see it gaining momentum. O.K., this has been a nice change of pace. Papers wait to be graded. Thanks for reading. The school was what could euphemistically be called a “teaching college.” At a teaching college you teach and you teach and you teach with no time for research, no time for contemplation, no time for participation in outside affairs. Just teach and teach and teach until your mind grows dull and your creativity vanishes and you become an automaton saying the same dull things over and over to endless waves of innocent students who cannot understand why you are so dull, lose respect and fan this disrespect out into the community. The reason you teach and you teach and you teach is that this is a very clever way of running a college on the cheap while giving a false appearance of genuine education. Texas ice and snowfall accumulation managed to eliminate the first two days of school this week, and ended today’s at noon. I took my philosophy class out into the courtyard for a few minutes, because they wanted to see the fat snowflakes filtering through the pines. As they pranced about in the winter wonderland, I looked at this pristine sheet of white on one of the benches, and decided to write in Greek uncials the word we translate as “excellence.” It’s a word that has driven me for years, elusive in its scope, yet always attractive with its possibilities. I posted the Robert Pirsig quote because for a week now I’ve been dulled and neutered, not so much by teaching, but by grading, and I’m still not out from under the pile. But I resolve to blow away the last bit of grading this weekend so I can figure out where I am and what I want to do next. Leisure has been out of reach, and purpose has been even further, and I feel a deep dissatisfaction with this (no, I don’t want to post a whiny blog!). All of this is just to say: I’ll revisit quality this weekend in my art, my reading, my writing and my music. I’ve been bereft of quality due to a plethora of tasks, deadlines, responsibilities, etc. It’s time to get back to things that matter. Spurred by depression, they strove to create imaginary worlds. to compensate for what was missing in their lives, to repair the damage they had suffered, to restore to themselves a sense of worth and competence. Having a day off has been filled with reward, especially with the icy conditions making travel unwise. It has been the perfect day for staying indoors with coffee, books, music and an opportunity to turn to artistic pursuits. After hours of grading, I pushed aside the papers and returned to re-reading a favorite book of mine by Anthony Storr. This book has probably helped me more in my study of artists, philosophers and poets throughout history who have turned to their craft as a means of finding some measure of coherence in a world they found largely unsatisfying. 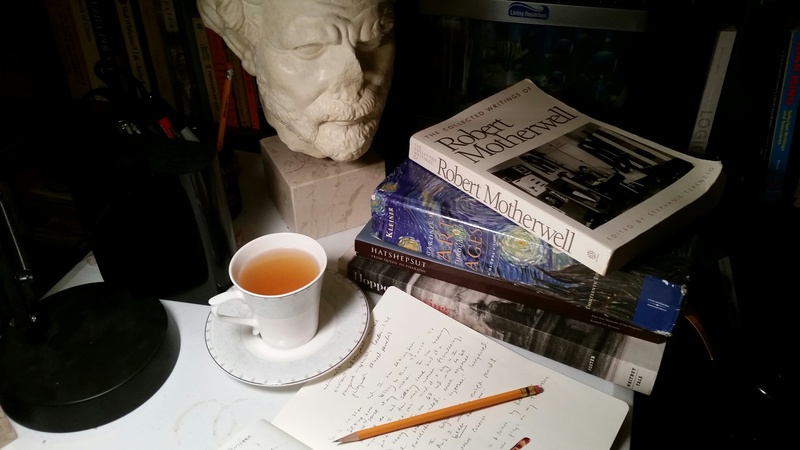 I don’t count myself among them, but still I love to retreat into my private world of ideas and see what I can put on paper with words and images. 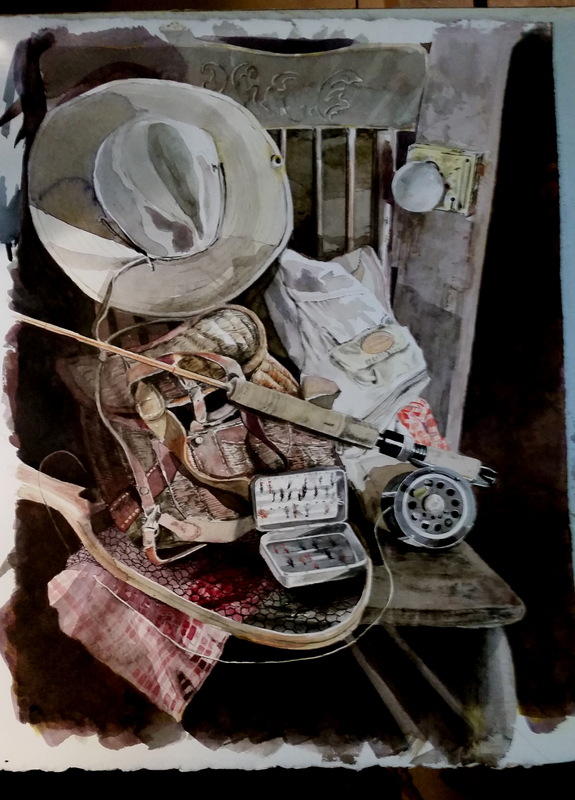 Returning to my studio I have attempted to complete a couple of still lifes begun weeks ago. 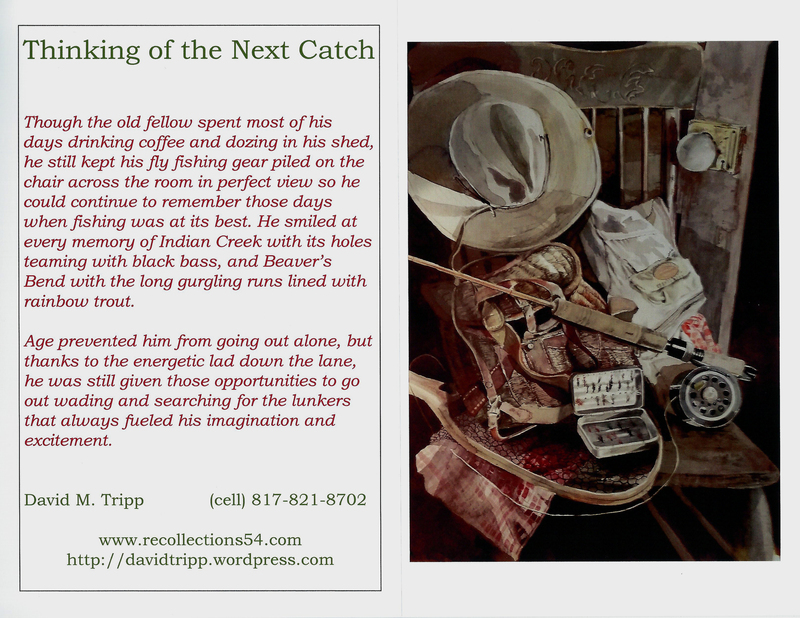 Though my fly fishing still life may not be finished, I decided to go ahead and compose a written piece about it and create a new greeting card (it’s been months since my last card was printed). Above I’ve posted a picture of it as it stands now. I’m inside of a month from returning to the art festival circuit so I’m starting to feel the push to get some new merchandise ready for display and sale. Astonished at a Painting of an Apple? I will admit I have yet to understand Cezanne’s sentiment in that statement. Paris and the rest of the world would be astonished at his innovative style and the way he ushered in a new century of modernist painting, but I’m still not sure how he believed his work on the apple would create astonishment. Nevertheless I have wanted to watercolor an apple for years and finally got around to attempting it this winter, and hope to continue improving in that subject. The garage has felt progressively colder the past three hours I’ve been at work there, so I’ve decided to return to the warmth of my house and spend the rest of the day “nesting” (and grading) inside. I’m glad I worked up the initiative to enter the garage and attempt to get the watercolor groove back. Perhaps I’ll get some more accomplished at my living room drafting table. We’ll see. At any rate, this has been an excellent start to the day. With today’s school closure, I just learned that the grading deadline has been extended an extra day. With a shout, I returned to my garage studio that I had not visited in nearly a month. Yes, it is 28 degrees outside and ice has covered everything, but this electric space heater works in the garage, two still life arrangements are still set up out here, and the paintings have been waiting my return. So far, I have spent all my time this morning darkening this fly fishing composition over more than 50% of its area, making the background darker and deepening the tones of all the middle values, leaving the highlighted areas untouched. The overall look of the painting has changed profoundly to my eye, but I like the change, and there is certainly no going back. I’ll let it dry out awhile and then return for another look. Meanwhile I have other paintings in progress that have languished for weeks. I’m ecstatic now for this opportunity to get back to them. Motherwell’s argument posted above has been buzzing in my head today while working on this still life, trying to bring it to fruition. One of my high school art teachers, Mr. Scucchi, was always trying to get me to understand this–no matter how naturalistic my style in rendering subjects in paint, the quality of the composition would always come down to abstraction, particularly to selection. I tried to listen, but didn’t really come to appreciate this until much later. My college painting professor, Dr. Unger, also urged this lesson upon me. Both instructors are now deceased, and I regret that I cannot tell them personally that I now get it, and wish I could tell them directly. I’ll always be grateful for their patience and belief in me as I struggled with these matters. 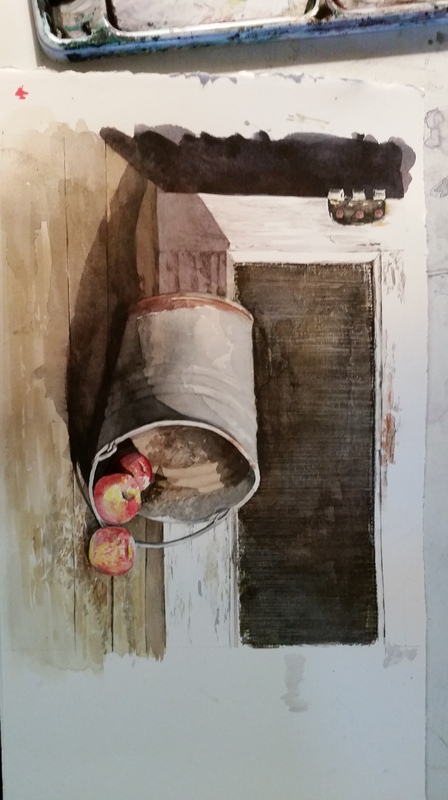 Lingering over this still life today has drawn me closer to their spirits and I’ve enjoyed this feeling of kinship. In many ways, their spirits hover about my work. What a wonderful way to spend a day off. Incidentally, I still graded for two hours this morning, and will do quite a bit more today. But what a joy knowing that the deadline is no longer tonight. The drilling machine for the Aargau lecture (“Biblical Questions, Insights, and Vistas”) is going at full strength and an unbroken pillar of smoke is rising from my pipe to the ceiling as in the best times of my life. Until now the progress has been “at the face” but not yet of any magnitude, and it has yet to be seen whether or not the direction of the tunnel is right. 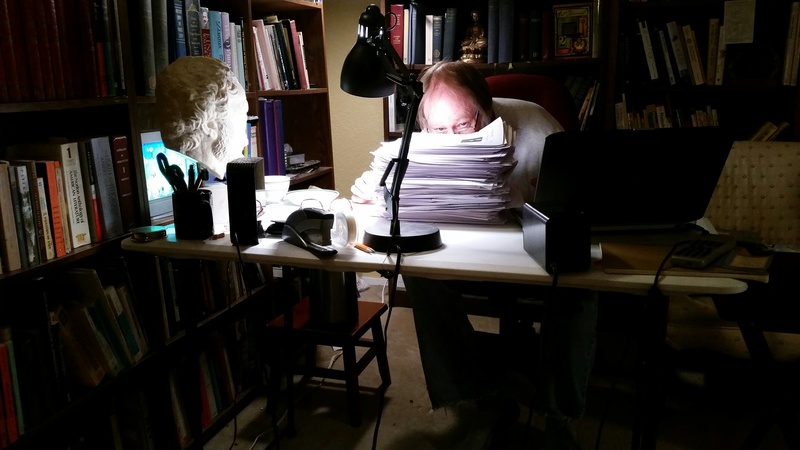 I am buried in my study with stacks of grading to do, and now face a possible shut-in situation as winter weather threatens my part of the country. There exists the possibility of my city icing over tonight and school being canceled tomorrow (darn). Taking advantage of the quiet, the dark and the cold, I have found ways to enjoy this Sunday, despite the grading. I opened a volume of my Karl Barth correspondences to his comrade in the early part of the past century, because I always remembered his satisfaction of working all day in his study with a continuous plume of smoke rising from his pipe. I don’t smoke, but I am pleased with the nonstop aroma of coffee that has charmed my study during this frigid, dark day. An added bonus is the conviction that this coffee is managing to keep me alert as I pore over pages and pages of scrawled words from my students. The Philosophy journals are filling me with satisfaction today, as I note a number of students seizing on something I mentioned in a recent roundtable seminar. I told them that high school schedules are set up with seven-minute passing periods between the classes, with the expectation for students to push aside what they have just learned in one subject in order to focus on a new one. Knowledge and grades are compartmentalized by subject, with no connective tissue between them, despite educational buzz-words like “writing across the curriculum” or “integrated learning.” The schools do not provide for any of this, as far as I can determine. The bell rings and it is time to put away the stuff from one class and pass on to the next. Just exactly when are they expected to integrate all this material, while they’re working their evening jobs or doing their homework? I had had brilliant professors or colorful ones or ones who cared about communicating knowledge or were profound in their reflection on the human predicament. But I had never had one who brought all these things together. Three words summarize [Paul Tillich’s] lectures for me: universality, depth, and caring. . . . In my solitary walks in Riverside Park after his class to let the ideas sink in, I was filled with a profound seriousness and joy, not only about the truths I had heard but also about my own life and the decisions I had to make. I am now reading Philosophy journal responses with great delight, as high school students share with me their thanks for my providing them that occasional space to “soak” what they are learning, and to integrate it with other subjects, and most importantly their personal life goals and aspirations. I guess sometimes they do hear and feel what we have to say to them. The grading for the weekend is promising to be one long, sustained grind, but I’ve remembered to stop intermittently and pay myself. After rising early this morning and grinding through my first tall stack of papers, I recalled that I’ve already worked 40-plus hours this past week (all teachers do) and am coming to resent that the hours were not enough–I’m losing a weekend to grading. So I stopped long enough to reward myself before plunging on to the next stack of papers. 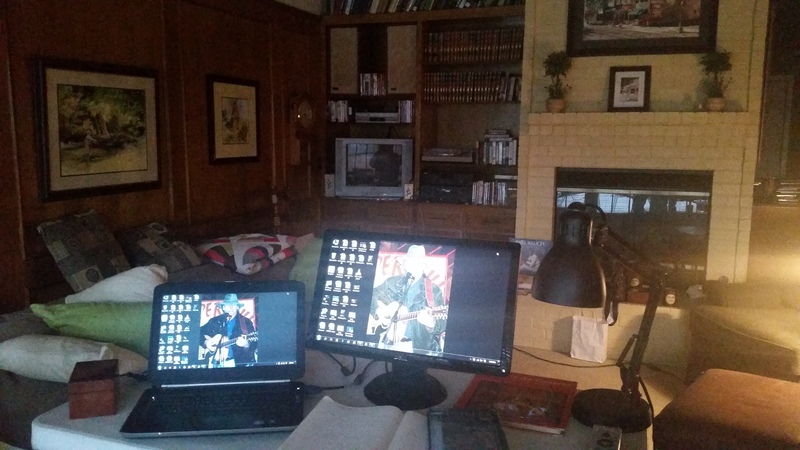 I put the new DVD on for my second listen (Crosby, Stills & Nash 2012) and felt some hurt when Graham Nash, now in his senior years, reported to the audience that they as a group had written a lot of songs over the years, but could have written a lot more. He then introduced their next song Wasted on the Way. I understand plenty of what he meant. Most of us probably live with regret that we didn’t do more of worth in our past endeavors, particularly when it comes to enriching others. I could not begin to record adequately the ways that CSN enriched my life throughout the decades–I don’t have that long of a manuscript in me, I’m afraid. As they closed out their encore, honoring teachers with Teach Your Children I of course know that I could have done more and better as a teacher throughout the years. But I’m not going to go there. What’s past is past, and I still have opportunities within reach. One of my driving philosophies of life is that a person has to pay himself/herself if there is to be any hope for being good for others. And I have tried to stay with that philosophy. Those who don’t know me well enough have accused me of being a workaholic. Not true. Much of what I do that they think is work brings me pure joy, and I feel that it is play. That particularly applies to studying the subjects I teach and creating works of art (no! I don’t regard grading as my joy–that is strictly work, strictly hell). So. 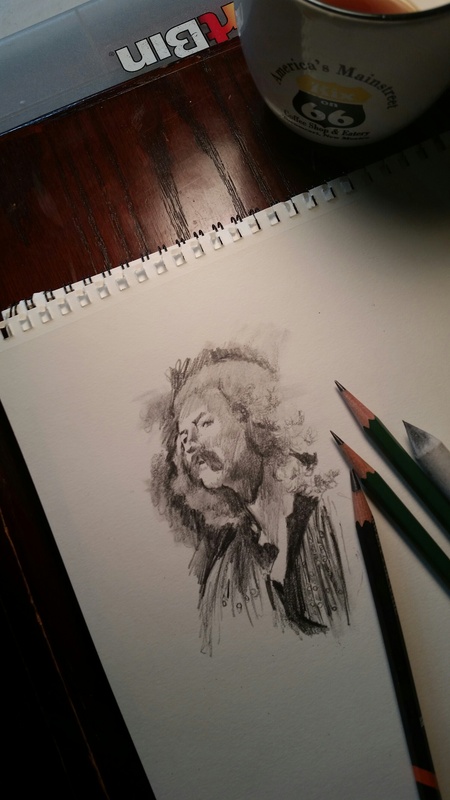 I laid aside my grading long enough to attempt a pencil sketch of a younger David Crosby. Though Neil Young has been closer to the center of my musical imagination in my later years, David Crosby was the one who stole my heart in 1969 when I was in high school. 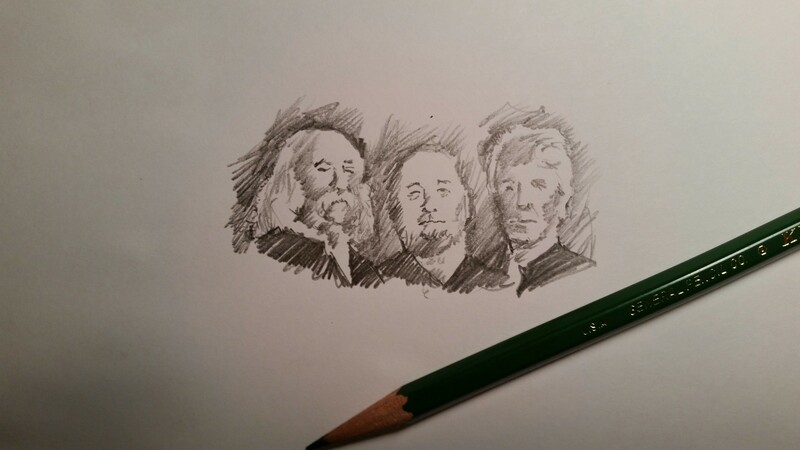 The first CSN album release immediately compelled me to drop the electric guitar with its power chords and pick up the acoustic guitar and pursue vocal harmonies. Crosby’s rich baritone voice was closest to my own range (though I wished like hell I could reach those clear sharp tenor notes of Graham Nash!). And I absolutely loved that Buffalo Bill Cody buckskin outfit he frequently wore! I was residing in Fort Worth when Crosby was arrested in the Dallas nightclub, and my heart was torn. Once he released his confessional autobiography Long Time Gone, I purchased it and read every word. I cried. I’m so glad he is back and O.K. for the time being. And I really appreciate that he is still writing music–his recently released Radio being my favorite of all time, as it speaks to what I feel in the teaching profession. I posted the lyrics at the top of this post, and am so delighted that it is part of the performance on this DVD. So, what am I trying to say? That if you wish to be good for others, and wish to do well in your endeavors, never neglect to pay yourself. Don’t burn out. Replenish. I will attempt to avoid burnout this weekend by doing some things that matter to me, including listening to music that moves me and attempting to push out some works of art. After a more-challenging-than-usual school week, I now face the ponderous task of grading stacks and stacks of papers to meet a report card deadline. As Friday afternoon stretched into evening, I decided I deserved a break and strolled into a music store and WOW, I found a DVD of a Crosby,Stills & Nash concert from 2012. To my knowledge, I have every VHS and DVD performance of theirs available, and had no idea that this one existed. The lyrics to the song posted above I heard for the first time in 1992 and was moved profoundly by the quality of the music as well as the message. But I only heard the studio recording that I’ve possessed, and it is driven by piano. On this new set, two acoustic guitars lead the song, and I cannot describe the emotion I felt as I heard the voices of my three vocal heroes mesh over the strains of the acoustic strings. At this point I can say no more. I’ll try to do some quality blogging this weekend, between grading.